Four-color process printed on Side 1. Side 2 printed with 1 PMS color using light coverage. 14pt C1S White Semi-Gloss stock coated with Aqueous Matte. V4 business card slits on right pocket. 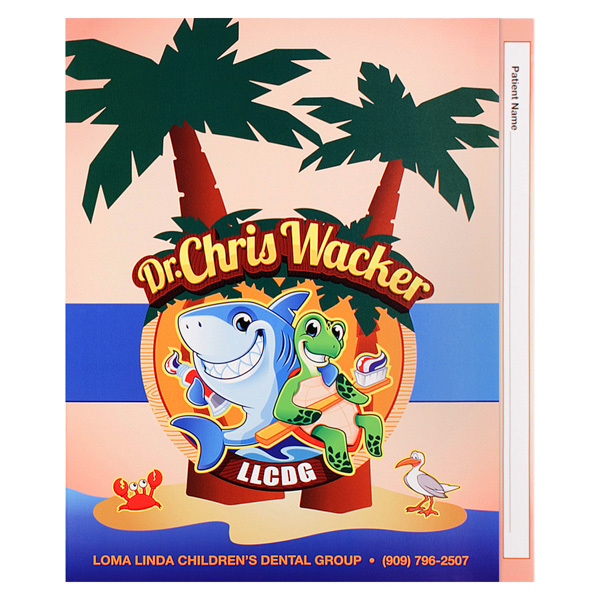 Loma Linda Children's Dental Group plays on the fact that they serve young patients with this file tab folder. The fun, colorful cover features creatures of the sea with toothbrushes on a sunny beach. Patients' names can be written on the tab. Room for notes is inside on the left panel, while paperwork and other records can be kept inside the blue pocket on the right. A tooth chart documenting when baby teeth were lost and permanent teeth started to come in is on the back along with the aquatic animal beach logo. An off-center crease makes the right panel slightly larger than the left, creating a 1" file tab. 3/4" of the tab remains visible when the item is folded, so you can print your brand name, contact information, or other text in this area. Both the tab and left panel are reinforced to withstand shuffling and chafing in a filing cabinet. The single right pocket's v-split design offers increased flexibility for carrying 8 1/2" x 11" paper. Carry your cover design over to the reinforced edges and pocket to add a splash of color to your design's interior.